Powell et al., 1998, 1999; G. Maise, personal communication] are two of the most promising systems: an assessment of the dose committed to the public arising from their use is necessary in order to show the impact they could have. To set to rest a very old misconception, there is literally no way a nuclear reactor, whether for power generation or propulsion, could trigger a nuclear explosion: the reason is the impossibility of reaching the proper conditions of confinement time and critical mass. However, what could happen is that, because of coolant loss, or other reasons, "runaway" fission in a reactor can heat too much the reactor core, eventually melting it down This is called a loss of coolant accident, or LOCA. When this happens (it did in the case of Chernobyl), high-temperature chemical reactions can occur, especially if water or graphite moderators are present. Water could be dissociated by the high temperatures, producing hydrogen and oxygen and possibly burning or exploding, and graphite could burn in an oxygen or hydrogen atmosphere. Besides, excessive heat release rates may also cause explosions simply due to rapid thermal expansion of the nuclear "fuel" or other reactor material. LOCAs are most serious in nuclear reactors. In the absence of a containment structure, radionuclides from the core can be ejected by the chemical or thermal explosion and contaminate the nearby environment. This said, it should be clear that this type of accident is in fact due to chemistry, not fission (the use by the popular press of the term "nuclear explosion'' in this context is due to ignorance and is misleading). To test the effects of an actual meltdown due to runaway fission, during the NERVA program a test was performed at Los Alamos in which a Kiwi nuclear reactor was deliberately allowed to explode by excluding the cooling system (this was the so-called Kiwi-TNT test). The results are reported in [Dewar, 2002, 2004]. The reactor was totally destroyed, but contamination was limited to a relatively small area, of order 100 m. After clearing appropriately the site of debris, activities were resumed. This test did much to allay fears that a NERVA-type core meltdown and explosion could in any way produce a large-scale catastrophe. A nuclear rocket reactor must be inherently far smaller than that in power plants, so the outcome of the Kiwi-TNT test is not surprising. 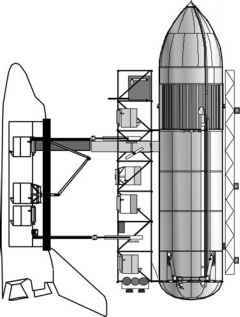 There is a specific and more serious concern in propulsion applications, where a nuclear reactor must be orbited, i.e., lifted through the Earth atmosphere, perform its interplanetary mission starting from LEO or MEO, and (possibly) be parked again in Earth orbit at the end of its mission. The question is: What could happen during each of these three legs? UN and US legislation address this question in depth [Lenard, 2008], and the interested reader should refer to it for details. Here this issue is briefly discussed from a simple technical viewpoint. Any reactor will contain fissile fuel, of order O(1) to 0(10) kg depending on fuel type. Of course no reactor will be operated while being lifted off, but the danger exists of an accident, such as that of the Challenger, in which a conventional launcher could explode, damaging the reactor to be orbited and spreading fissile material from the damaged reactor stored in the payload bay either in the atmosphere or on the ground. During the interplanetary trajectory, however, any accident would not affect Earth. The most dangerous occurrence would be if the reactor, containing all the (new) radionuclides produced during operation in space, were for some reason to re-enter Earth's atmosphere accidentally: in fact, no space agency is considering deliberate re-entering of nuclear reactors, so that such event would have to be unplanned, unwanted and therefore accidental. The consequences would be the spreading of many families of radionuclides in the atmosphere, at a height that can be estimated at roughly between 40 and 10 km, at the peak of aerodynamic heating. The total mass of radionuclides spread would be approximately the same as of the original fuel, i.e., O(1) to 0(10) kg. Additional contamination would come from secondary radioactivity, that is, induced in the reactor structural materials. As for the actual consequences, this event is similar to what happens during an atomic explosion in the atmosphere, where fissionable material and bomb structure are vaporized and released. Data from atmospheric atomic tests exist that can be effectively used to estimate these effects. In any event, the quantity of radionuclides in an atomic explosion is many times larger than in any nuclear reactor at this time envisaged for space missions; accordingly, radioactive contamination is expected to be smaller (see [Lenard, 2008]).